You receive orders or arrange schedules via e-mail. 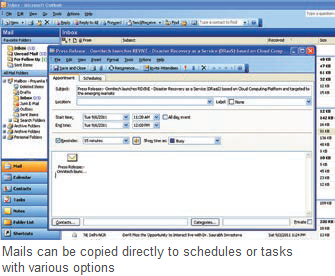 Then you transfer this information manually to the calendar or define a task for the same. This can be done in a simpler way. The transfer is possible in Outlook via Drag&Drop from e-mails to Calendar. Select the relevant e-mail from the list, then right click and drag it to ‘Calendar’ or ‘Task’ option on the left hand side navigation area. Then release the right key. Outlook will show you a context menu. Here select the desired action. For instance if you select the option ‘Copy here as Appointment with Attachment’ then while your e-mail will remain unchanged in the inbox, you will get all the contents including attachment in a newly created schedule. Here you can edit, make changes before saving it.